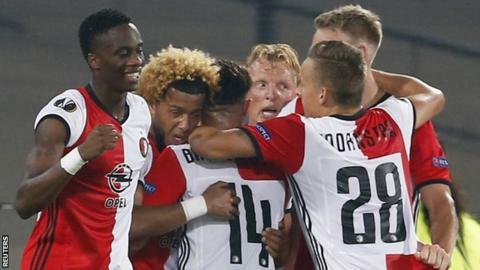 Manchester United produced a lacklustre display as their Europa League campaign began in defeat at Feyenoord. Jose Mourinho made eight changes from the team beaten by Manchester City and an Anthony Martial shot going wide was their only first-half chance. Zlatan Ibrahimovic came on for the visitors and headed wide as he failed to turn around his side's fortunes. Instead, Nicolai Jorgensen, who was offside, crossed for Tonny Vilhena to drive in Feyenoord's late winner. Ibrahimovic went close to an equaliser with a drilled free-kick but it was saved at the second attempt by former Liverpool keeper Brad Jones. The defeat means United have lost four successive European away games for the first time. Paul Pogba, who re-joined United in a world-record £89m move from Juventus in August, had his lack of discipline and positioning heavily criticised by ex-Liverpool defender Jamie Carragher following Saturday's derby defeat by City. If playing alongside Ander Herrera and Morgan Schniederlin in midfield against Feyenoord was supposed to allow him freedom to display his attacking skills, Pogba failed to take the opportunity to do so. The France international was a peripheral figure in the first half as he epitomised a lack of urgency and intensity from the visitors. Pogba pushed further up the pitch after the break and, despite looking a little more threatening as he attempted two long-range shots which went comfortably off target, he could not find the quality to help find a way through the Dutch side's defence. How did a Rooney-less Man Utd play? England forward Wayne Rooney has played behind United's main striker so far this season but was rested for this trip. United boss Jose Mourinho claimed he had other "solutions" for the role but the poor performance of his supporting cast of players can have done little to persuade him of the strength of his other options. The midfield trio of Herrera, Schneiderlin and Pogba, along with wingers Anthony Martial and Juan Mata, left Marcus Rashford too isolated. Rashford, who burst on to the scene with two goals in a 5-1 Europa League win over FC Midtjylland on his Manchester United debut in February, struggled as he made his first start of the campaign. He was replaced by Ibrahimovic, who was part of a triple substitution after 63 minutes which also introduced Memphis Depay and Ashley Young, and the Swede gave the attack more of a threat but United still did not look like scoring. Asked if the players who came in failed to take their chance, Mourinho said: "I don't want to go in that direction. I don't want to personalise. Obviously, some played better than others. It was the first game for some." On his selection for this coming Sunday's Premier League trip to Watford, the manager added: "We go back to a normal team without so many changes." Eredivise leaders Feyenoord came into the game in good form, having won their opening five league games, scoring 15 and conceding twice in the process. Managed by former Arsenal and Barcelona left-back Giovanni van Bronckhorst, their team included former Liverpool players Dirk Kuyt, who scored a hat-trick against United in 2011 in his time at Anfield, and Jones. Keeper Jones had a much quieter evening than he might have expected and the Dutch side could have taken the lead in the first half when Jens Toornstra blazed high when he had time and space to shoot. They defended with purpose to nullify United's limited threat and were rewarded with Vilhena's goal, even though Jorgensen was clearly offside when he supplied the cross. Feyenoord manager Giovanni van Bronckhorst: "In the second half you saw that Manchester United want to win with the tempo and the three substitutions, you sensed that they want to leave here with the win. "At the right moment we scored the goal - a fantastic goal on the counter-attack. "After that the spirit came in the team and the determination to be there for the last 15 minutes. We fought hard to get the result and after 90 minutes we did." Jose Mourinho was managing a side in the Europa League for the first time since winning the competition with Porto in 2003, when it was called the Uefa Cup. Zlatan Ibrahimovic made his first appearance in the competition since November 2001, when he was playing for Ajax. For the first time in their history, Manchester United have lost their opening group game in Europe in consecutive seasons. United have gone six games without a clean sheet in Europe since a 0-0 draw with PSV in November 2015. Manchester United are in Premier League action on Sunday, when they travel to Watford for a 12:00 BST kick-off. Feyenoord face a trip to PSV Eindhoven in a top-of-the-table Eredivisie match. Match ends, Feyenoord 1, Manchester United 0. Second Half ends, Feyenoord 1, Manchester United 0. Attempt blocked. Eric Bailly (Manchester United) header from the centre of the box is blocked. Assisted by Memphis Depay with a cross. Corner, Manchester United. Conceded by Terence Kongolo. Attempt blocked. Zlatan Ibrahimovic (Manchester United) right footed shot from outside the box is blocked. Attempt saved. Zlatan Ibrahimovic (Manchester United) right footed shot from outside the box is saved in the centre of the goal. Substitution, Feyenoord. Bart Nieuwkoop replaces Rick Karsdorp. Marcos Rojo (Manchester United) wins a free kick in the attacking half. Foul by Dirk Kuyt (Feyenoord). Attempt missed. Marcos Rojo (Manchester United) left footed shot from outside the box misses to the left. Foul by Rick Karsdorp (Feyenoord). Attempt missed. Ashley Young (Manchester United) right footed shot from the centre of the box is high and wide to the right following a set piece situation. Attempt blocked. Chris Smalling (Manchester United) left footed shot from the centre of the box is blocked. Assisted by Zlatan Ibrahimovic. Ander Herrera (Manchester United) wins a free kick on the left wing. Morgan Schneiderlin (Manchester United) wins a free kick in the defensive half. Matteo Darmian (Manchester United) wins a free kick in the defensive half. Foul by Terence Kongolo (Feyenoord). Corner, Manchester United. Conceded by Dirk Kuyt. Attempt blocked. Memphis Depay (Manchester United) header from the centre of the box is blocked. Assisted by Ashley Young with a cross. Corner, Manchester United. Conceded by Tonny Vilhena. Attempt blocked. Memphis Depay (Manchester United) left footed shot from outside the box is blocked. Attempt saved. Marcos Rojo (Manchester United) left footed shot from the left side of the box is saved in the bottom right corner. Assisted by Paul Pogba. Goal! Feyenoord 1, Manchester United 0. Tonny Vilhena (Feyenoord) left footed shot from the centre of the box to the bottom left corner. Assisted by Nicolai Jørgensen. Attempt missed. Memphis Depay (Manchester United) right footed shot from outside the box is high and wide to the right. Assisted by Ashley Young. Attempt blocked. Memphis Depay (Manchester United) right footed shot from outside the box is blocked. Assisted by Paul Pogba. Attempt missed. Zlatan Ibrahimovic (Manchester United) header from very close range is high and wide to the left. Assisted by Ashley Young with a cross following a set piece situation. Foul by Jan-Arie van der Heijden (Feyenoord). Attempt missed. Bilal Basacikoglu (Feyenoord) left footed shot from outside the box is close, but misses to the right. Offside, Manchester United. Paul Pogba tries a through ball, but Ashley Young is caught offside. Attempt blocked. Nicolai Jørgensen (Feyenoord) left footed shot from outside the box is blocked. Assisted by Jens Toornstra. Rick Karsdorp (Feyenoord) wins a free kick in the defensive half. Substitution, Feyenoord. Bilal Basacikoglu replaces Steven Berghuis. Foul by Karim El Ahmadi (Feyenoord). Foul by Marcos Rojo (Manchester United).